The Sienna will be an easily driven boat and so we don’t expect to need a lot of power to have her at 5 knots. 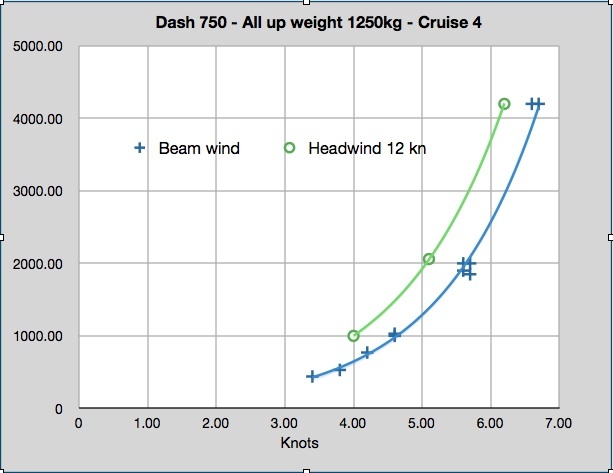 My guess is that her performance would be similar to the Dash 750 and if we look at the power curve for that boat it shows the power needed for at 5 knots is 2000 watts (into the wind). That means we can use a Cruise 2 and at full power of 2000 watts we can expect 5 to 5.5 knots. And in fact probably a bit more because the Torqeedo motors tend to run at slightly above their rating when given full power. For example my Cruise 4 at full power shows 5300 watts on some occasions, and so we could expect up to 2600 watts could be available from a Cruise 2. This is an important consideration in a rental situation where the renter doesn’t want to be worried about running the batteries flat and not being able to get back. So ideally the boat needs to be able to run at full speed for the rental period and have enough battery capacity for that condition, and a bit more for safety. I have in mind that a standard rental would be half a day, say four hours, so we need to have enough battery capacity to give at least four hours running. And build in a safety margin I will do the calculations on 5 hours at full speed. Even a 1003 would have enough power to run this boat at a useful speed of 4 knots but the battery capacity of the built-in battery is not sufficient to be viable as a rental boat. So back to the battery bank calculations for a Cruise 2: 5 hours at 2600 watts is 13000 watt-hrs. This is the usable capacity, so we need to convert this, depending on the battery chemistry, to reasonable nominal capacity. See more about this below under the headings for the different battery types. The main options for LFP cells are, Thundersky, now called Winston batteries, and Sky Energy, now called CALB, or China Aviation Lithium Battery which manufactures a similar battery. Given the height limitation we’d need to use a pack based on 90 or 100 ah cells as these come in at 214mm so they would be suitable. If we built a pack from 100ah cells, which are 3.2 volts each, the power available from each cell is are 3.2 x 100 – 320 watthrs. These cells can be safely discharged to 80-90% on a regular basis so we need so we need to factor in a extra 10 to 20% of capacity so that normal use does does not exceed this drawdown. For 13000 watthrs we need about 40 cells. I’d round this up to 48 cells, so we still have a multiple of 8 (we need 8 cells to make 24volts). A bank of 48 cells would provide a capacity of 15360 watthrs. This is about exactly right, because using the target 13000 watthrs is 84% of this bank. These cells are available in Australia from EVWorks (Winston batteries) and EVPower (CALB batteries), and both these companies are in WA. EVWorks have enough 100 ah cells in stock to be able to ship the 48 cells right away. EVPower have some on order but delivery time will be early May and it could be a bit tight for our objective of having the Sienna ready for the Sanctuary Cove boatshow on 19-22 May. 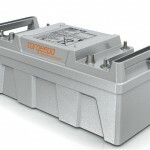 Torqeedo have announced an upgraded battery in the Power series and it has some impressive features of safety and ease of use. It has been designed from the outset to be a marine battery and so is waterproof to 1m and has automatic cut-off switch that shuts off power if the battery is submerged. It has built in protection against over charge, and over discharge, which are especially important to manage on Lithium cells. It includes a built-in charge regulator so that solar panels can be directly connected, and it has built in monitoring of state of charge. Torqeedo’s strategy is to have smart batteries and dumb chargers. This battery is 104 ah at 24v and so would be ideal for this project. One battery would provide 1 hour run time for the Cruise 2, and so we would need 5 of these batteries. Because of the sophisticated controls built in to this battery we can use its full power rating and do not need to allow a bit of spare capacity as we do for the LFP cells. 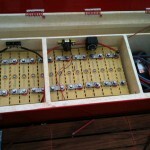 A problem for this project is that at present these batteries are not available. They are expected soon, but it still could be one or two months until there are some in Australia. 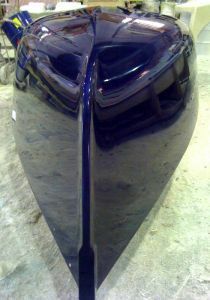 The time-line for this project is tight—we’d like the boat ready to show for Sanctuary Cove starting on 19 May. I’ve decided against choosing this battery because of uncertain availability. A direct comparison of purchase costs between the Torqeedo Power and the LFP batteries does not tell the full story. The sophisticated controls that are built in to the Torqeedo Power battery are not readily matched by the LFP batteries although some of the features can be added at extra cost. The battery management system for the LFP cells includes individual cell monitoring but this has to be wired in situ and is a non-trivial task. Waterproofing can also be achieved by building waterproof battery boxes. I will do this work myself to keep the budget to a minimum, but for a realistic comparison we should allow a reasonable commercial value for this work would be around $6000 extra for installation compared to the Torqeedo Power battery. Anyone considering such a project, and having it done professionally would need to budget for these installation costs. 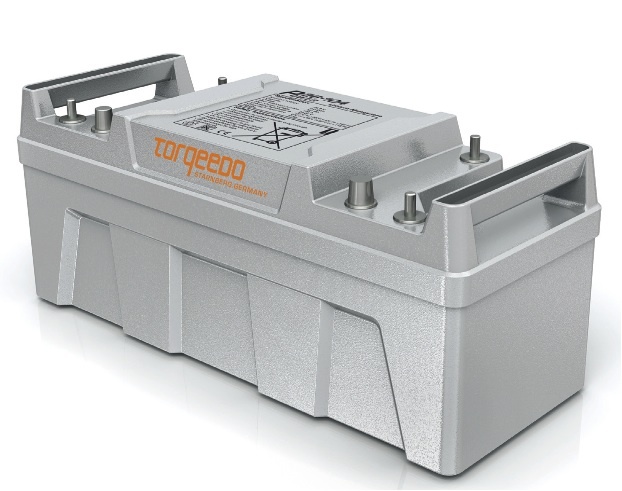 An operational advantage of the Torqeedo Power batteries is that because of the battery intelligence, the state of charge is known, and is displayed on the remote throttle control. In the case of the LFP cells, and also the Optima batteries, charge status will be monitored by a TBS battery meter. The readings of range and battery status shown on the remote throttle are not being updated for additional charge coming to the batteries from the solar panels. So both the remote throttle and the TBS meter need to be read in conjunction to keep tabs on battery state of charge. These are the lead-acid batteries of choice for most marine installations today. These batteries are sealed and in our experience the Optima brand perform well under adverse conditions. 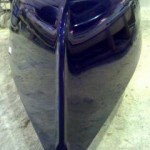 For this comparison well use Optima batteries as a suitable base line that most marine users are familiar with. A pack could be made up of 75 ah batteries, each of which weigh 27 kg. The generally accepted target for reasonable longevity of these batteries is to limit discharge to 50% of nominal capacity. Each battery has a nominal capacity of 12v x 75 ah = 900 watthr. For our target of 13000 watthrs we’d need 14 batteries. This would be 100% discharge, so desirably we’d need to double this to allow for only 50% discharge. But we are running into a size and weight problem here. The mass of 14 batteries is 378kg. This is 200kg more than the 180kg needed for the LFP pack. This is equivalent to about 3 people in the capacity of the boat, and so to use even these batteries we’d need to reduce the payload from 9 people to 6, and this reduces its commercial viability. And at this rate we have not allowed for any safety buffer or be limiting drawdown to a reasonable value. We are also running into space restraints. The available battery storage area in the Sienna is 2m long by 600 wide. The 75ah Optimas are 325 long x 165 wide. So two of them end to end cannot fit into the 600 width. So we’d need to arrange them in three’s side by side. In groups of three, the width is 495, which is ok, and there is a enough length to have 6 of these groups of three. So the maximum number of batteries we could fit is 18. This would give us our target 13000 watthrs plus an extra 25% which would be less than desirable for drawdown but sufficient for a safety buffer. The mass of these would be 300kg more than the LFP cells and equivalent to 4 passengers. 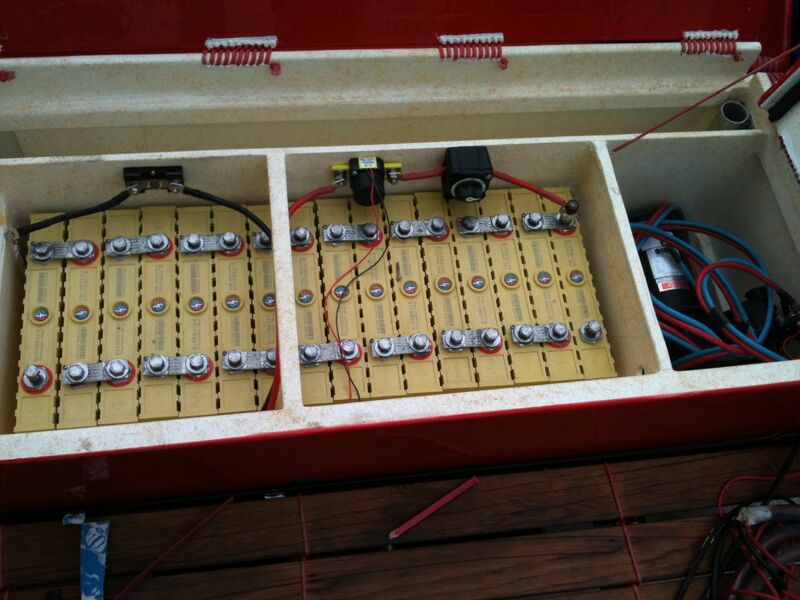 At this point I would decide against using these batteries or look at ways to downgrade the expected rental period for the boat, or ways of reducing the power requirement. But for the purpose of direct comparison lets assume a pack of 18 would be satisfactory, so continue the costing. These batteries are available in the $350 to $450 price range. We’d need to have a charger, a solar regulator, a battery monitor, and cabling. So the budget price is more or less the same as for LFP batteries. The penalty is high weight and shorter expected life (compare 500 cycles to 4000 cycles). The advantage for some may be that these batteries are commonplace and therein lies a certain comfort of familiarity. I would like to be able to choose the Torqeedo Power batteries, but for this project, delivery time prevents me from doing so. If delivery was achievable in the time, then budget would become an important factor, although the final cost amounts to only about a 10% increase in the total project cost, which I consider to be minimal. In my view the AGM batteries are too heavy and have a shorter life expectancy than the Lithium options. My choice is the LFP Thundersky batteries that are available now from EVworks, and so I have ordered a pack of 52 cells, the extra 4 cells to be used as house battery. Torqeedo offer a “throttled” version of the Cruise 2 which draws a maximum of 1000 watts, and this option could be considered if it was important to proceed with AGM batteries for this project. This could mean a pack of say 10 would be about right. This would not impact so much on passenger load, and the budget for all batteries could be reduced. In a rental situation with the Sienna this could be a suitable setup. 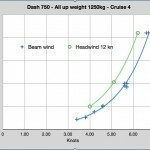 Using the Dash 750 curve from above we see that at 1000 watts we could expect a speed of around 4.5 knots and this would be fine. Using this target it now means that AGM batteries can be used with a reduction of maybe only 1 in payload. It also works in favour of using a pair of Torqeedo Power batteries for the battery bank. A pair would provide about 5 hours use at full speed and this is a good safety margin. The simpler installation means these batteries would be the choice for most rental operations. I suspect that this combination of a throttled Cruise 2, and two Torqeedo Power batteries will be the “sweet spot” for a Sienna rental boat. The total cost of motor and batteries would be around $12000 and you’d simply plug them in and they’d work with minimal installation costs, and simple day to day management and operation.